1906. 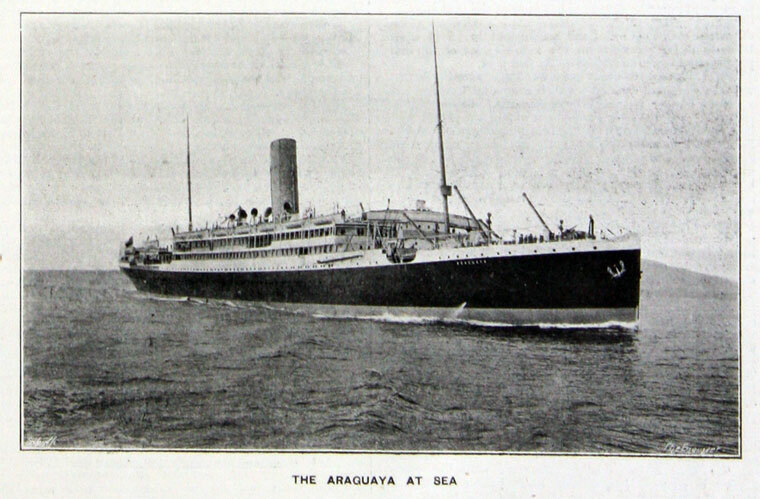 The Araguaya at sea. Owned by the Royal Mail Steamship Co.
1918. Postcard sent to Australia. Shows horses taking the engines to a liner. 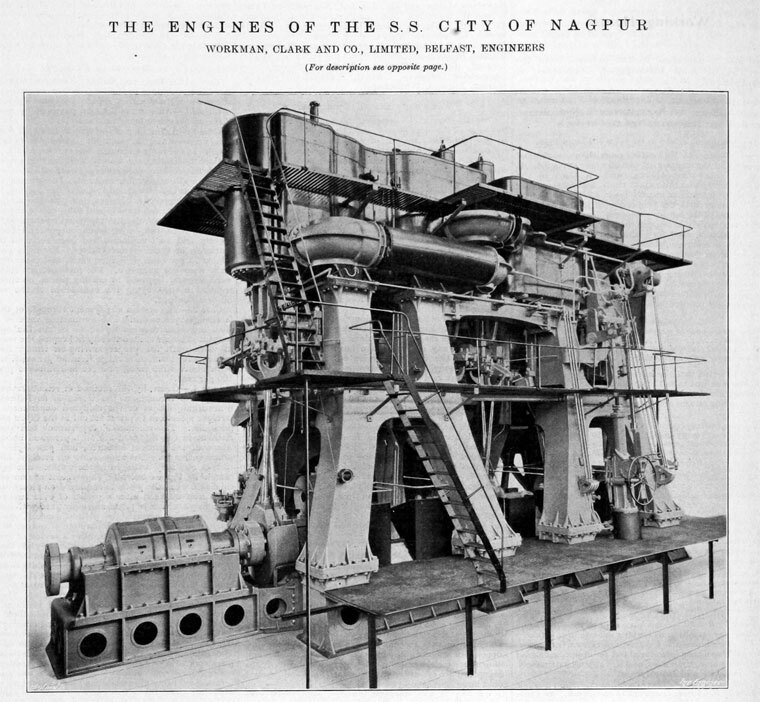 1922.The Engines of SS City of Nagpur. 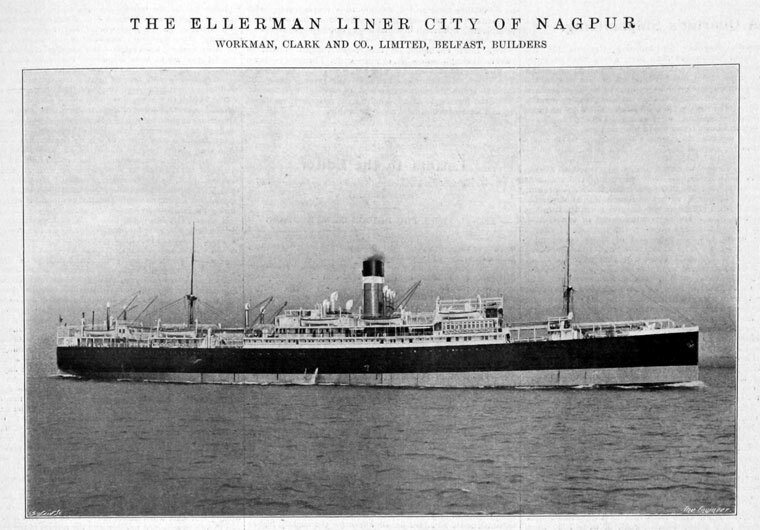 1922.Ellerman Liner City of Nagpur. 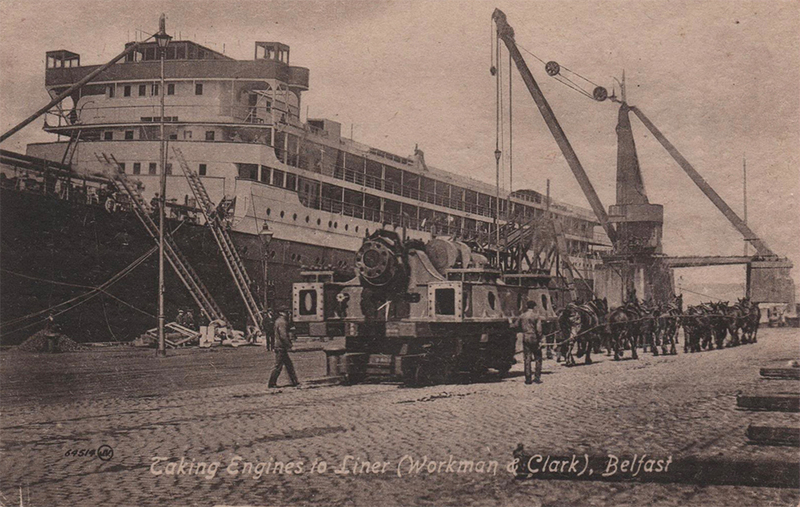 Workman, Clark and Company of Belfast Shipyard, Belfast. 1880 Company formed as a limited liability company, by Frank Workman and George Clark (1861-1935) who had both previously worked for Harland and Wolff. Both partners also had good family connections to other shipyard companies. 1880s Initially, the partners built hulls and coasters, however by 1881 the funds were running out and Workman managed to secure an order for an iron screw four-masted barque from his in-laws, the Smith family of Glasgow who ran City Line. This led on to a series of orders for sister ships which kept the company going until the 1890s. 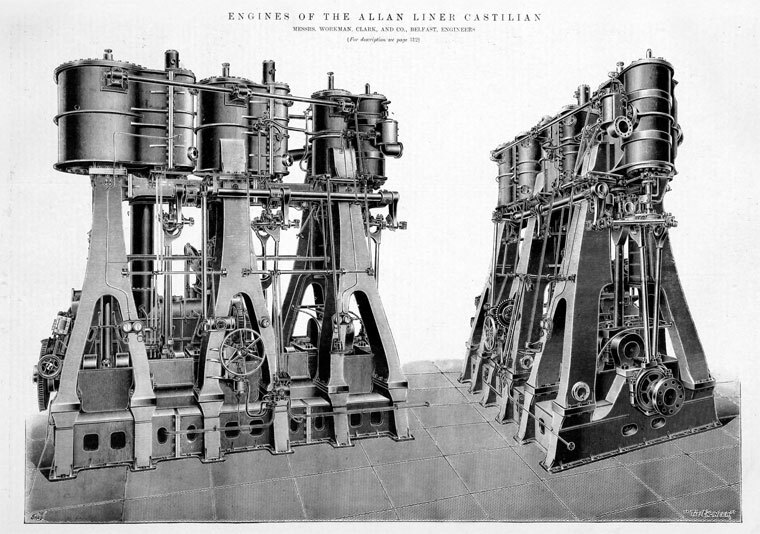 1890s The company was now able to make its own boilers and engines at its Victoria Engine Works. In 1904 the yard built an important vessel Victorian, which was the first passenger carrying turbine driven Transatlantic voyager ever. 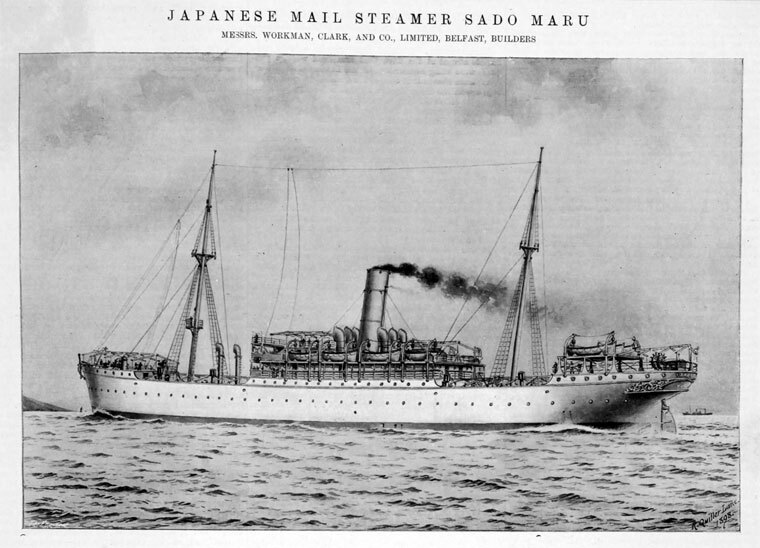 As before, this led on to orders for many more similar types of ship for a number of different companies. WWI This was perhaps the peak output time for the yard. At this stage the yard employed 12,000 people. The work consisted of repairs, naval orders and merchant ships. Alongside this, the demand for fruiters, cargo-liners, cargo-ships, and standard "B" tramps continued. The yard also set a world record for the number of rivets driven home by one man in one working day: 11,209. 1919 Acquired the yard of the Northumberland Shipbuilding Co.
1918 The Furness Group sold the Howdon yard to new owners led by R. A. Workman of Workman, Clark and Co Belfast who were associated with Sperling & Company, London Merchant Bankers. Sperling and Company used the Northumberland company to create a shipbuilding combine, the largest in Britain under Sir Alex Kennedy. As a public company, The Northumberland Shipbuilding Co. Ltd acquired majority holdings in William Doxford and Sons of Sunderland, followed by Fairfield Shipbuilding and Engineering Co of Govan; Workman, Clark and Co of Belfast; Blythswood Shipbuilding Co; Monmouth Shipbuilding Co and the Lancashire Iron and Steel Co.
1920 The value of the company rose from £2.4m to £7.0M by 1920. 1923 This situation changed in 1923 as the yard was making losses of £3.12M. Consequently, the Northumberland Shipbuilding Co defaulted on guaranteed debenture interest. This led to litigation, and shareholders seeking damages for deceit, conspiracy and statutory liability. Acquired the Lanarkshire Steel Co, with a capital of £450,000, owning steel works and collieries in Lanark. 1928 The Company changed its name to Workman, Clark (1928) and after some help from the Government, the debenture holders of the old company settled for one third of their stock value. During the 1920s, the yard made a number of liners including Bermuda, which had a history of bad luck due to a fire on board and breaking loose from its moorings. Fourteen fruit carriers were made for Elders & Fyffe and the Standard Fruit company over the ten years between 1920 and 1930. In addition ten standard "G" class meat carriers were made in the post war period along with 28 cargo-liners, eight twin-screw motor-ships and 17 cargo ships and tramps. Finally, ten tankers and a whale factory ship were built at the yard during this period. 1930s Things began slowly for the yard in the 30s with only two Shell tankers and a second whale ship launched. In 1932 only a fruiter was launched, and most of the workforce were laid off. 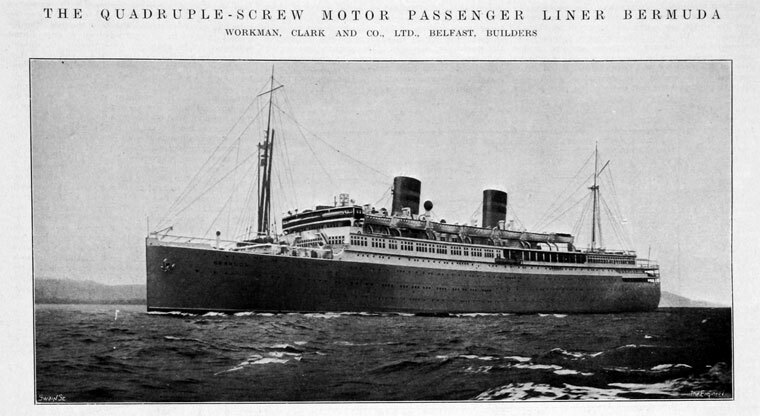 As 1932 came to a close though, orders began to arrive again for passenger/cargo motor-ships, cargo liners and a tanker. 1934 Orders dried up again in 1934 and the majority of the workforce were once again laid off. 1935 The company went into receivership in May 1935. The North yard was purchased by National Shipbuilders Security and dismantled during World War II by the Lagan Construction Company. The South Yard started shipbuilding again at the beginning of the war under Harland and Wolff as their Victoria Yard.